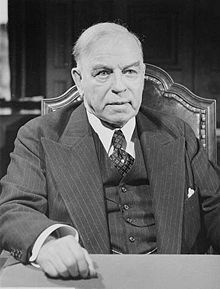 William Lyon Mackenzie King was Prime Minister during the 16th Canadian Parliament. The 16th Canadian Parliament was in session from December 9, 1926, until May 30, 1930. The membership was set by the 1926 federal election on September 14, 1926, and it changed only somewhat due to resignations and by-elections until it was dissolved prior to the 1930 election. It was controlled by a Liberal Party minority under Prime Minister William Lyon Mackenzie King and the 14th Canadian Ministry. The Official Opposition was the Conservative Party, led briefly by Hugh Guthrie, and then by Richard Bedford Bennett. The Speaker was Rodolphe Lemieux. See also List of Canadian electoral districts 1924-1933 for a list of the ridings in this parliament. Following is a full list of members of the sixteenth Parliament listed first by province, then by electoral district. Government of Canada. "14th Ministry". Guide to Canadian Ministries since Confederation. Privy Council Office. Retrieved 2006-11-09. Government of Canada. "16th Parliament". Members of the House of Commons: 1867 to Date: By Parliament. Library of Parliament. Archived from the original on 2006-12-20. Retrieved 2006-11-30.